Sending a note of congratulations to colleagues when they hit big milestones, such as a new job, is a great way to keep in touch and strengthen a connection. You should send a personal congratulations letter to former co-workers or current colleagues who are leaving for a new position at a different company. Receiving this type of note lets people know that you are thinking of them. Plus, sending your best wishes and congratulations is good manners and a nice gesture. Follow the tone and voice that you would typically use in correspondence with this connection - if you are writing to a former manager, your tone may be slightly more formal than if you are writing to a current co-worker who accompanies you on daily coffee breaks. If you are sending the note via email, your subject line can be "Congratulations" or "Heard the Good News" or something along those lines. Even though the note is a casual, personal congratulations, make sure that your spelling and grammar are correct, and avoid abbreviations and emojis. While this person is a friend, they are also a business contact, and in this context should be accorded the respect an associate deserves. Remember that your network is a key asset in your career trajectory, and making a good impression with all your colleagues will always be beneficial. The note doesn't have to be formal or complicated. The main thing that you should communicate in the letter is your heartfelt congratulations. 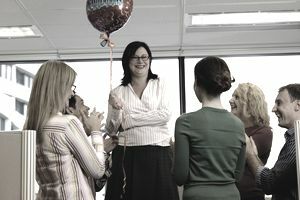 If you are sending the note to a current co-worker, it's appropriate to mention how they will be missed at the office. You might take the opportunity to mention some of the projects you have worked on together, and some of the successes you have shared. Let them know that you are happy they have a new opportunity and wish them all the best. If you're sending a note to a former colleague, and you haven't been in touch recently, you may want to let them know where and how you heard the news about their new position. You can say, "I saw on LinkedIn that you got a new job as account director over at Hayes and Burnes, and wanted to reach out to say congratulations." Your note is a good chance to reinforce your relationship, and you could also take the opportunity to suggest meeting for coffee to hear the details of their new position, and offer your support. You should make sure that you include your current contact information, and that you have theirs. Most often, a congratulations letter to a colleague for a new job will be sent through email, but sometimes sending a card through the post is appropriate. Especially today, when so much correspondence is read on a computer screen, a handwritten card can provide a personal touch to your sentiments, and may make your good wishes stand out from others. If you go this route, make sure your handwriting is legible, and as always, that your punctuation and grammar are flawless. I was thrilled to hear about your new job with the Yankee Company. I know it's been a long search to find the right position, but it seems like this is going to be a good match for your skills and experience. I'm looking forward to hearing all about it soon! When you have settled in, I would love to take you out for a coffee to catch up on everything. Best of luck with your first days in the new position. Congratulations on the new position as Director of Finance at Woodstein & Burns! This is such a wonderful opportunity for you. Our loss will be W&B's gain, and I know you'll do such a fantastic job over there. I'm sad to see you go, and I'll certainly miss our Monday morning coffee runs, but feel certain that you're making the right choice accepting this position. Let's keep in touch, please! I'm eager to hear how the new position treats you. How Do You Write a Resignation Letter Amid a Scheduling Conflict?